Greece has never abandoned its claims for reparations for its occupation by Germany during the second world war or for the repayment of a forced wartime loan, President Karolos Papoulias has told his visiting German counterpart. In reply, Gauck, who is on a three-day visit, said that he could only express the official line of the German government on the matter. He added that he was honoured to be able to accompany Papoulias, who he described as “a fighter who fought against the barbaric invaders who inflicted so much suffering on the country”. On Friday, the two heads of state will visit the village of Ligkiades outside Ioannina, the site of a massacre of 92 people by German troops on 3 October 1943, where the German president will lay a wreath. He will also meet with representatives of Ioannina’s Jewish community. On 25 March 1944, the entire Jewish population, numbering 1,850 men, women and children, were deported to Auschwitz-Birkenau. Only 163 would survive. 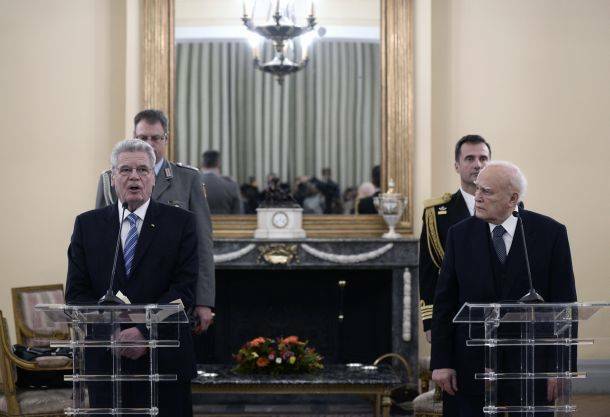 Before his meeting with Papoulias, Gauck mentioned that the aim of his visit was to demonstrate solidarity with an historic place. “I would like to confirm the long-standing friendship between the two countries, which may have be overshadowed by recent incidents and discussions, but it still remains strong,” he said. “I would like to talk with people on a different modern Germany, as the ties beteen the two peoples have a long history. This history yesterday was confirmed at the Acropolis,” the German president said.